The Title "Far From Home" is written by Ellie Dean. This book was published in the year 09. The ISBN number 009956047X|9780099560470 is assigned to the Paperback version of this title. This book has total of pp. 458 (Pages). The publisher of this title is Random House. We have about 81941 other great books from this publisher. Far From Home is currently Available with us. September 1940. Staff Nurse Polly Brown has been granted a posting at Cliffehaven Memorial Hospital on the south coast to be near her badly injured husband, Jack. But her decision has meant that she has had to part with their beloved five-year-old daughter, Alice, who is traveling to safety in Canada. 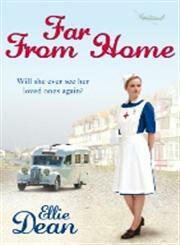 Polly's heart is torn in two as she says good bye to Alice and heads to the Beach View Boarding House in Cliffehaven. Here she befriends a young polish woman, Danuta, who has lost her entire family in the war. Although Danuta is a qualified nurse the matron at Cliffehaven Memorial refuses to believe her and she is forced to work there as a skivvy. And just as Polly is trying to come to terms with the fact that Jack is unlikely to survive his injuries, a telegram arrives at Beach View. The boat Alice was on has been torpedoed by a German U-boat . . .
Ellie Dean lives in Eastbourne, which has been her home for many years and where she raised her three children. She is also the author of There'll be Blue Skies.